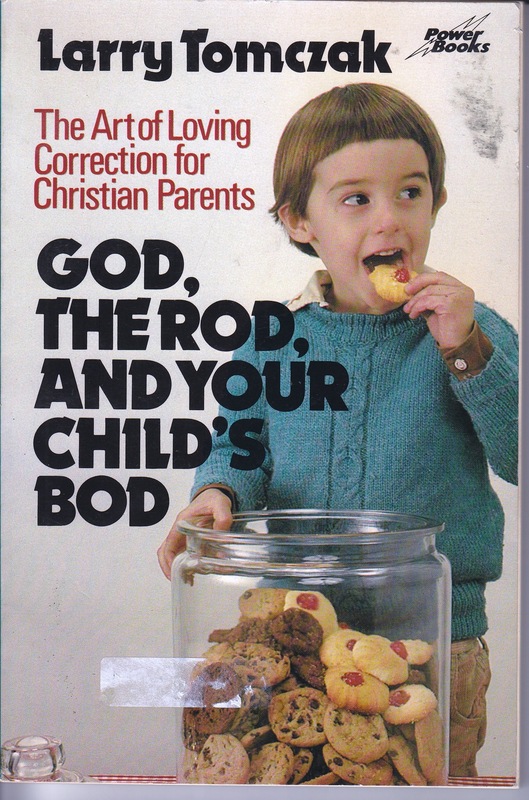 Submitter: This book was being weeded from our library due to condition (though its age would have most likely have eliminated it), but the cover made us laugh hysterically. This is a fine example of a book that isn’t necessarily awful, just very old and very poorly packaged. We’ll never be able to look at a three year old the same way again. From that crazed look in his eyes we would definitely have to categorize him as ENEMY! 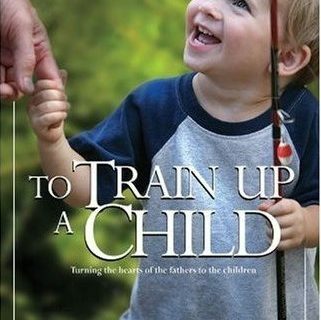 As the proud owner of a 3-year old, I think this would be a really informative book. Note how the 3 year old bares his teeth to threaten and intimidate. I just discovered this blog yesterday. I absolutely love these “awful” book finds. Thanks for such a fun blog! It’s a Justin Beiber clone! We have the whole series. Your Two Year Old: Terrible or Tender. Your Four Year Old: Wild and Wonderful. Your Five Year Old: Sunny and Serene. Your Six Year Old: Defiant But Loving. So five year olds are just perfect all the time? Every single other age is trouble, but five year olds are just “sunny and serene”? It just seems very incongruous. And it also doesn’t seem sarcastic, and if it is, it’s even more incongruous. Oh and our copy opens to a photo of a (different) kid brandishing a baseball bat at the photographer. A friend wouldn’t bite your face off as soon as you let your guard down. I think this child would. One more vote for enemy. The photo actually reminds me of the kid from Kubrick’s The Shining. This book is from an early childhood education series. We have “Your Two-Year-Old: Terrible or Tender?” The faculty would not allow us to weed it. Unfortunately, the title could pass for a cookbook. I have a three-year-old… and she’s both my friend and enemy (mostly my friend) – and she does NOT look like a lost Lawrence brother, circa Gimme a Break. No wonder this 3 year old boy? is an ENEMY. It’s the Dorothy Hamill haircut. 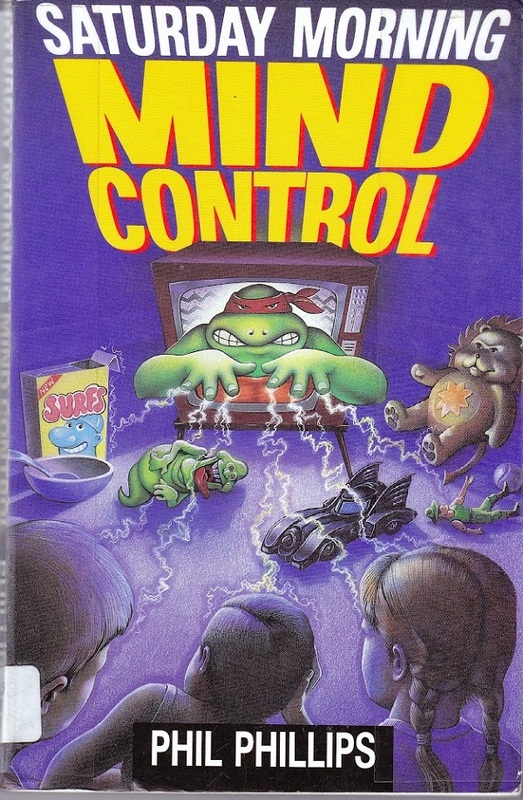 I read this book when my son was 3 (1991) and I thought it had really good information and explained his behavior. And because 3 year olds are absolutely like that. I think the cover on mine was different – I guess it was a new edition with a more up-to-date hairdo on the cover. Um…I think he looks more like that kid from Eight is Enough who ended up in rehab numerous times. In all seriousness, though, isn’t this series considered a classic in early childhood development? Lois Ames used to be at one time. I will defer to someone who knows the field better than I do. However, it may be that you should reorder a new and/or revised edition copy. This is a classic from one of the best childrearing series ever! Seriously, those Ames & Ilg books are great. You need to overlook the sexism and old technological references, but the information about how their minds work at different ages is really useful. I would be sad if my own library got rid of this title, as I borrowed it and really benefited from it. I agree that the cover is a bit much, though. As the mother of a 3-year-old who some how stumbled across this book a few weeks ago, read it cover to cover in 1 hour flat, and it did as much good for me as I assume 6 months of therapy would have (my 3-year-old is most often my enemy), I implore you to order the new version. Oh. I was gonna say that I found up to the age of 3 to be a breez, but 4 was a KILLER. With both of them. That child looks like he would grow up to be Tucker Max. I worked for a year at a used bookstore, and we would plaster our break room w/ random cartoons, cheesy posters and book covers we found particularly hilarious. THIS was one of the prizes in our collection. SO FUNNY. 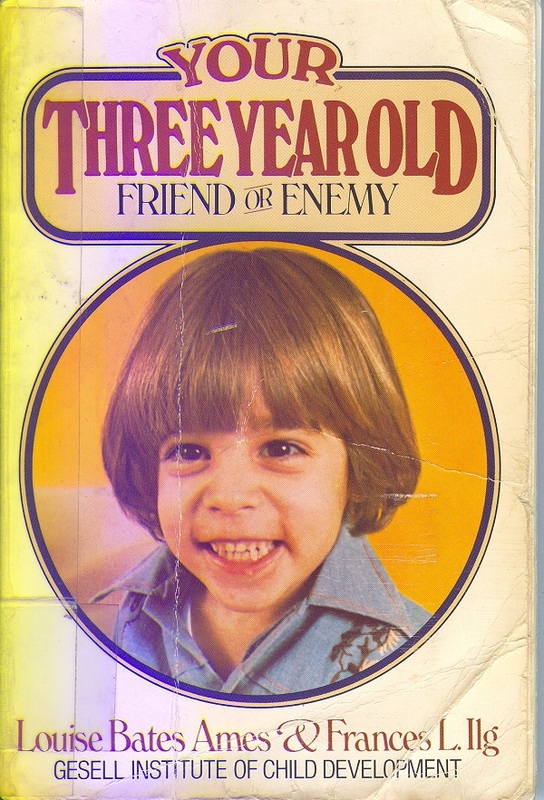 I wonder where that kid is today, if he’s a productive member of society or total psychopath…and if he’s embarrassed that this book was his first and only modelling job. Yes, this series is still considered a classic of childhood development theory, but doesn’t belong in a popular collection of a public library (although they were reissued in 1991 with new cover pictures). Perhaps a teacher’s college would still keep them. I have been slowly weeding them throughout my tenure at several different branches whenever I see them. Over the years, they have been catalogued in 155.423, 305.234, and 649.124 so the whole series was never shelved together for context anyway. Ours are all shelved together but we use LC. I’m surprised that you say that these don’t belong in a public library but rather in a teacher’s college. My experience has been that they are very popular with the average reader and were suggested to me by another mother. They are for parents. I think a large public library system ought to order an updated edition and keep for the public. And I’ll add that this is the first book on the blog that I have thought should be kept in a contemporary public library collection, so I am not about keeping everything. These are considered major works *for parents* who want to understand children’s development. Although they are a bit dated in places, there isn’t really anything that’s superseded them. Why would you weed them? Also, they are aimed at a lay audience, so a teacher’s college does not seem like the answer. As a new parent I have been looking for these books at the local library, and it makes me feel frantic to know that there are librarioans actively removing these books from the shelves. I understand that shelf space is limited and ‘get rid of outdated stuff’ is an important organizing principle, but in this instance I fear you are throwing out wheat, not chaff. LOVE the title! It’s so refreshing. 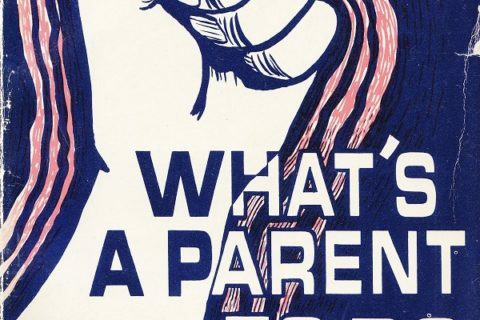 Contemporary parenting books aren’t allowed to be nearly as honest. Winona, I agree, the second I saw him I thought, “Is that a young Joey Lawrence?” And I think his enthusiasm would have been put to better use for that face painting book! Those eyes… those huge haunting eyes with bags under them… I will never forget them. Ack! It’s the devil child! I agree that this series is great. When you live in a small town and your options are this or “Babywise” you learn to ignore out of style cover photos. He looks like a piranha! We own three copies of this title, two in our Parents’ Collection and one in adult nonfiction, and all are well used. It’s good basic information about child development. I’d vote for getting a newer copy because this one looks well worn–and the newer copies do have updated covers. This was fine for its time, but looks dated. Damien – don’t ever turn your back on them. He’s the enemy for sure. that’s one EVIL lookin’ child. 3 years old in 1976 = 40 today. Yeah, he probably just WISHES his hair was still that thick.